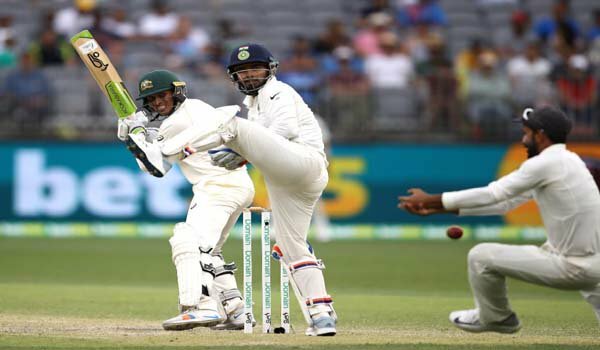 Melbourne: It wasn't an exciting day as expected, as the hosts managed to hold themselves at 258/8 on the fourth day of the third test here at Melbourne Cricket Ground (MCG) on Saturday. Australia needs 141 runs to win the Test. Indian skipper Virat Kohli will look to strike early on Sunday morning, the fifth day of the Test, to take an unassailable 2-1 lead in four-match series.At stumps, Pat Cummins with 61 (not out) and Nathan Lyon unbeaten on six were still at the crease. Chasing a mammoth total of 399 runs, Australia got off to a bad start in its second innings too, as they lost Aaron Finch for three and after that his opening partner Marcus Harris for 13 runs. Usman Khawaja was dismissed for 33 runs, reducing Australia to 63/3. However, Shaun Marsh and Travis Head, stitched together a partnership of 51 runs for the fourth wicket, which is first fifty partnership by the hosts in the match. Kohli brought back Jasprit Bumrah to the attack and the 25-year-old right-arm fast bowler did not disappoint his captain as he removed Shaun Marsh for 44 runs, breaking the partnership.Mitchell Marsh was caught by Kohli off Ravindra Jadeja for 10. Pacer Ishant Sharma bowled with cross seam, Travis Head looked to drive, but the ball took inside edge and deflected to the stumps. Head departed for 34. Tim Paine, who was batting good, was caught by wicket-keeper Rishabh Pant off Jadeja for 26 runs. It was Pant's 19th catch in the series. With this catch, the 21-year-old Pant equalled the Indian record of taking most catches by an Indian wicket-keeper in a Test series. Mitchell Stack's (18 off 27) resistance was ended by medium fast bowler Mohammed Shami. The ball was pitched outside off stump and swung in for the left-hander, clipping the stumps.Earlier, India declared their second innings for 106/8 with a total lead of 398 runs.